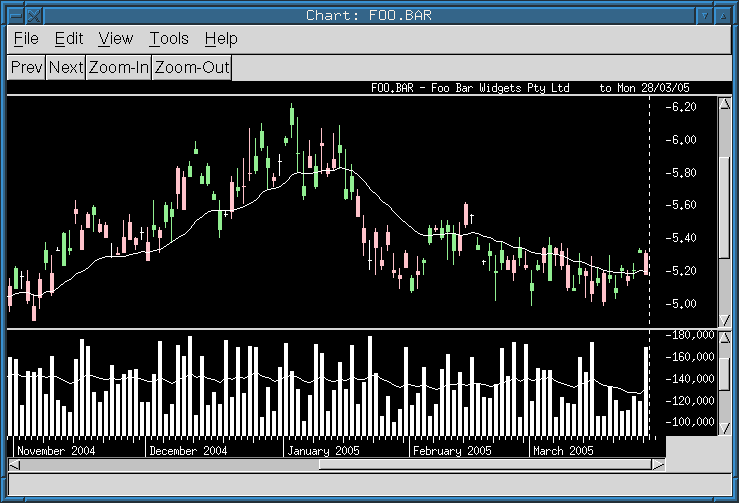 Chart downloads and displays stock and commodity charts, using data from various sources, mainly Yahoo Finance. It features various indicators and averages, and data downloading. There's tie-ins to look at indicators from Genius Trader and TA-Lib. Read more in the online manual (one web page per node, or there's a single-file HTML in the sources below). The current state is slightly just keeping-it-going and there's a couple of niggling problems (Bugs below). Chart is free software (free as in freedom, and also free as in no cost). Chart is published under the terms of the GNU General Public License (v3 or up). To run Chart you need Perl 5.10 up, Gtk2-Perl 1.220 up, and a list of Perl modules as long as your arm, per the Makefile.PL in the sources but available from CPAN. Download version 267 here, either the .tar.gz source, or a Debian package out of my repo. The sig files above are Gnu PG ascii armoured signatures, generated from my key. There's a SIGNATURE file inside the .tar.gz for cpansign too. For the deb, dependencies not in the Debian archive are in the "other" section of my repo, including Genius Trader and TA-Lib tie-ins. Otherwise try dh-make-perl. There's some sort of bug in the drawing when doing Control-U download updates at the same time as viewing. It's supposed to redraw as the download proceeds and at completion, but something bad happens to cause no drawing, even on a normal "expose" window overlap and reveal. The suggested workaround is to go "n" next and "p" previous which forces a redraw. Control-L is a redraw too, but doesn't help when stuck in the bug. The automated symbol lists (All and Alerts) sometimes get themselves jumbled or duplicate entries. Running the "Tools/Vacuum" rectifies. This page Copyright 2005, 2006, 2007, 2008, 2009, 2010, 2011, 2012, 2013, 2014, 2015, 2016, 2017, 2018, 2019 Kevin Ryde, except for the GPLv3 logo which is Copyright Free Software Foundation and used here in accordance with its terms. This page created using GNU Emacs, the most powerful web editor -- get access to every HTML feature.